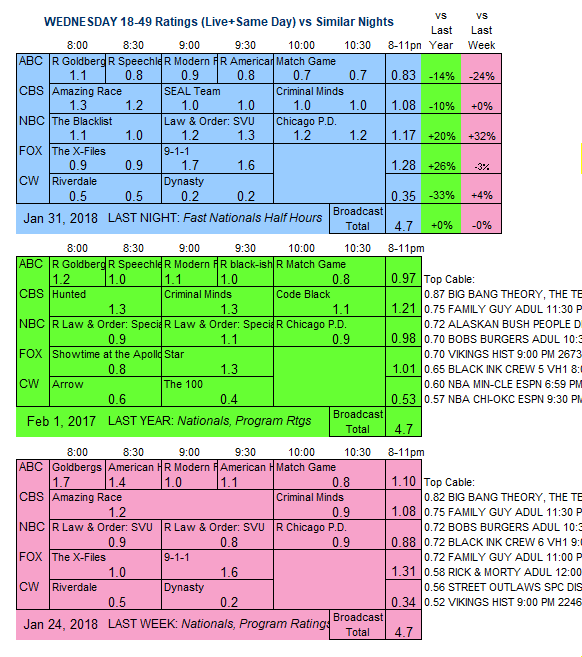 NBC: Returning from a week off, THE BLACKLIST was steady at 1.1, SVU lost 0.1 to 1.3, and CHICAGO PD dropped 0.2 to 1.2. FOX: THE X-FILES fell 0.1 to 0.9, and 9-1-1 held at 1.6. CBS: Back in its 1-hour format, THE AMAZING RACE remained at last week’s 2-hour 1.2. CRIMINAL MINDS rose 0.1 to 1.0. 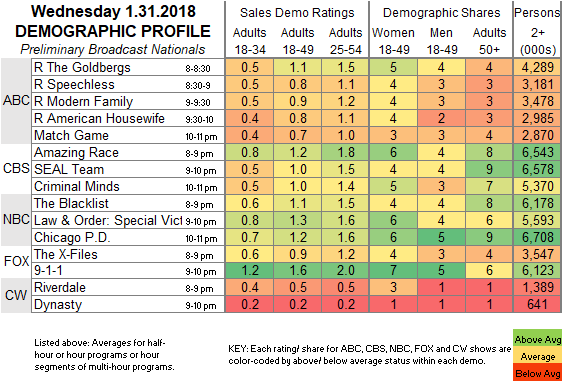 CW: RIVERDALE (0.5) and DYNASTY (0.2) were steady. ABC: After sitcom reruns at 0.8-1.1, MATCH GAME was down 0.1 to 0.7. On the final Thursday before Olympics coverage kicks in, NBC airs the season finale of THE GOOD PLACE and an early run of the pilot for the new sitcom AP BIO.